Pictogram gives instruction for change of consciousness mode from individual to the united. 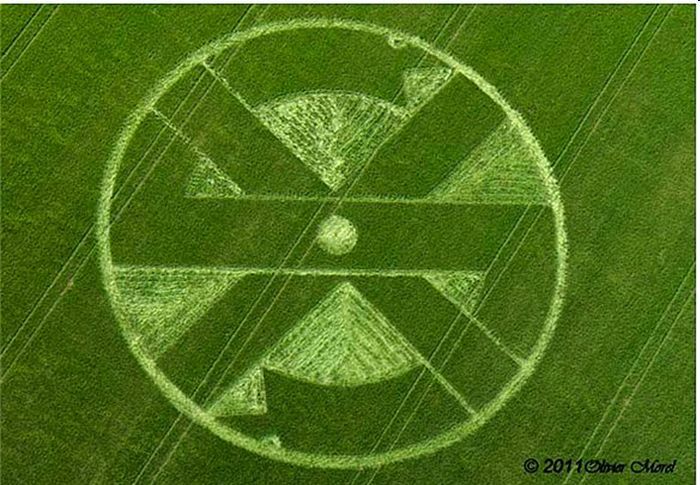 On the eve of summer solstice 20 June 2011 near Stonehenge arise the crop circle containing two serpents and a cross. 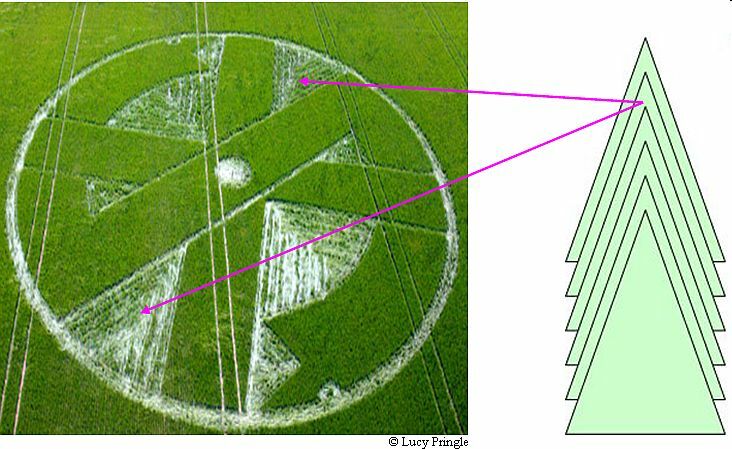 Researcher Pete Peterson noted that «this is symbols represents an old ancient sign that means: There will be an extraordinary event in the physical world which surpasses all known human or natural powers. This symbol is popular and was taken as the logo by legendary band Crass. So, what information is transmitted by this pictogram from the ETC symbols of consciousness point of view? In the middle of the pictogram is placed a small circle. It represents a brain area of an individual information cell of a human being. Individual information cell is a presentation of a human being on the Information level of the Universe. An information cell is the key to analogue principle of coding of ETC messages. An information cell consists of a circle with dark ring – an external border. Dark circle in the centre is a brain area. A body area is located between a brain area and external border. The cell on the pictogram has a very thick border. Wide border of individual cell is a result of carbon nature of human’ life and reveals in wars, acts of terror, indifference to fate of other people. The wide broken outer ring shown on the pictures below by grey color represents the interrupted thick border of the individual cell. The broken border of a cell represent interrupted life of humanity remained in the individual regime of consciousness. At the two ends of interrupted ring are placed two heads of serpents. In ETC symbols of consciousness image of serpent means global cataclysms. So, the pictogram informs that life of humanity will be interrupted by global cataclysms if we prolong the individual mode of consciousness. A cross passing through a small brain area of individual cell in the center confirm and strength this information. So, this pictogram is a warning about destruction of our civilization remaining in the individual regime of consciousness in global cataclysms. This pictogram also shows the only way for humanity salvation through the unification of all civilization consciousness. This information is shown by many perpendicularly joined elongated rectangles forming zigzag. 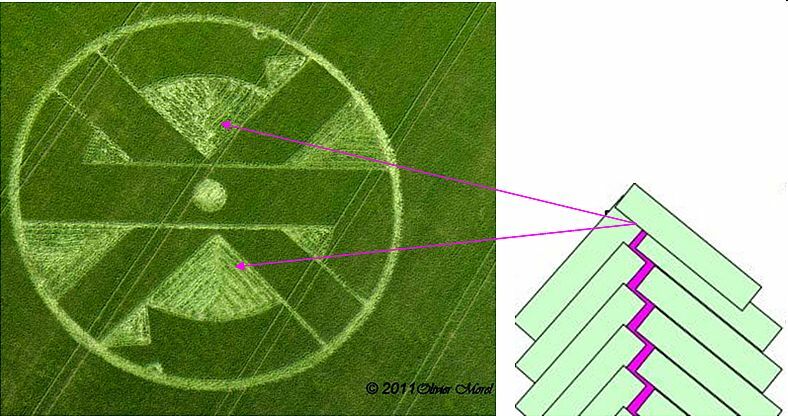 They are located in two big segments between two perpendicular parts of the cross. Zig-zag is formed by joined rectangles repeated many times. So, in ETC symbols of consciousness zig-zag means the unification of consciousness of all civilization necessary for prolongation of our life. Symbol of zig-zag is presented in many ETC pictograms in Peru – Chachapoyas, Saksahuaman, Pachacamak and others. In the pictogram there are two arrows. Each side of the arrows consists of many parallel lines. Arrows are placed between one part of the cross and bar connecting two parts of the interrupted ring ended by serpents. Each arrow consists of two lines forming acute angle. Two arrows point on small circle in the center of pictogram representing a brain area of individual cell. It means our decision to remain in the individual regime of consciousness is the reason of civilization destruction in global cataclysms. Eye of serpent represent individual cell with small brain area in the center. 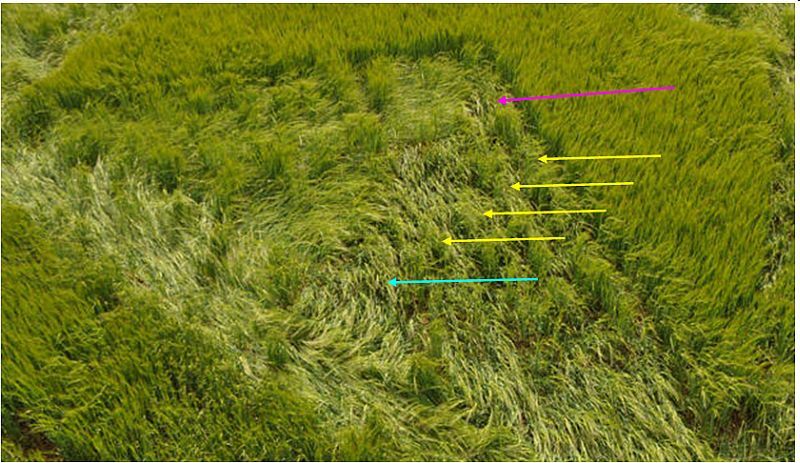 This center marked by bunch of grass. Three semi circles around the bunch represent three previous levels of consciousness included in the individual cell of human being. Consciousness of human being corresponds to fourth level. Replacement each of two eyes near the biggest ring represents the shift of a brain area to the border of the cell at the united consciousness formation. Number two point on the unification of consciousness of two individual cells. Each mouth of serpent consists of two perpendicular lines. It is one element of zig-zag. In right angle where these lines intersect is placed a square. Two sides of a square located on these lines of a right angle. From each of two other sides of the square depart four lines which are perpendicular to owned side. On the space placed between two blocks of four lines is located a large circle. A square (pink arrow) represent the brain area of individual cell of human being, corresponding to the fourth level of consciousness. Four lines (yellow arrows) also point on the fourth level of consciousness. Big circle in the center (blue arrow) represent expended brain area of the united cell. So, opened mouths of two serpents inform, that individual consciousness which is placed at the very throat of serpent will be destroyed. On the other hand, two heads of serpents represent the united consciousness formation. So, only the unified consciousness of humanity represented by expanded brain area of the united consciousness cell on the border of open space and serpent’s mouth, will survive. ETC warn that before global cataclysms three preliminary cataclysms of incredible power will happen. Three pre-disaster - three warning signals before the start of a global cataclysm. So, the pictogram is a warning about the first pre-cataclysm coming soon as an extraordinary event in the physical world which surpasses all natural powers known by humanity. In the ETC symbols of consciousness serpent is the symbol of global cataclysms. Serpent is presented in many complexes of the System of Information Transmission of ETC. Incredible demonstration of coming global cataclysms danger for humanity is presented by shadow effect at the Temple of Kukulcan in the complex Chichen-Itza. 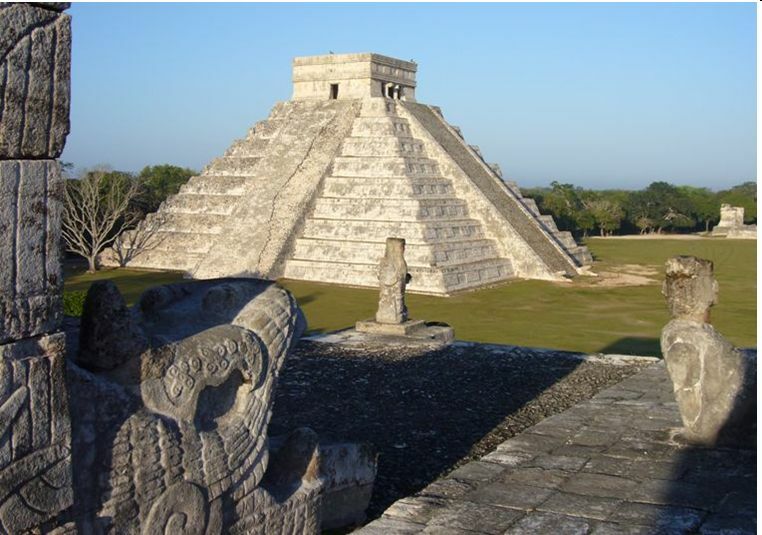 The Temple of Kukulcan is 9-stepped pyramid 24 meters high with wide stairs on either side. On the spring and autumn equinoxes – March 20 and September 21 – about three o'clock in the afternoon sun's rays illuminate the western balustrade of the main staircase of the pyramid so that the light and shadow form a picture of seven isosceles triangles. It make up, in turn, the movement of serpent’ body 37 meters long, creeping from the top to his own head with open throat carved at the base of the stairs following the sun. Thousand of people come all over the world to see this effect. Shadow effect forms zig-zag line which represents the united consciousness formation necessary for the Transition to the Highest level of the material world without cataclysms. ETC inform that it is the only way for prolongation of life in coming global cataclysms. Zig-zag line is also presented in the observed pictogram 20 June 2011. 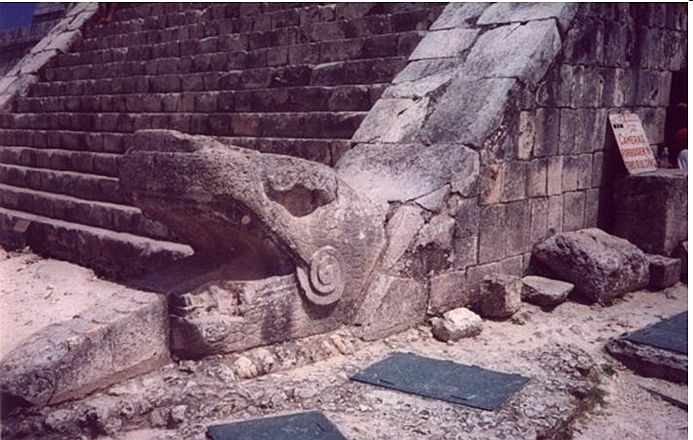 In the complex Chichen-Itza warning about destruction of humanity retaining in individual mode of consciousness by global cataclysms is presented also by stone statue Chac Mool and two serpents behind him from both sides of the man. Stone statue Chac Mool is a symbol of transfer individual consciousness into the united consciousness. So, in the complex Chichen-Itza is presented terrible picture, depicting helpless humanity, left face to face with global cataclysms of incredible power, shovel the earth's surface for the destruction of mountains and leveling the surface of the planet. This way is presented humanity, which has not made a decision about consciousness unification for the Transition to the next cycle of life. Humanity has to unite consciousness with one common goal – to remove our body from the level of global cataclysms. The laser beam caused by civilization’ united consciousness action will remove our bodies from the level of global cataclysms – level of Crystal Structures (LCS). Simultaneously we will arise on the safe Highest level (HL) of the material world without cataclysms with new holographic body. We will prolong our life in the cycle of the Correction and everyone will be responsible for the actions he makes. So, do good today. Thus, the process of the united consciousness formation of Earth civilization for the Transition represent by numerous columns in the Temple of a Thousand Warriors. Today population of Earth is 6.8 billion of people. Each column depicts a brain area of individual cell of human being. The Highest level of the material world is shown by the top level of the Temple of the Warriors. 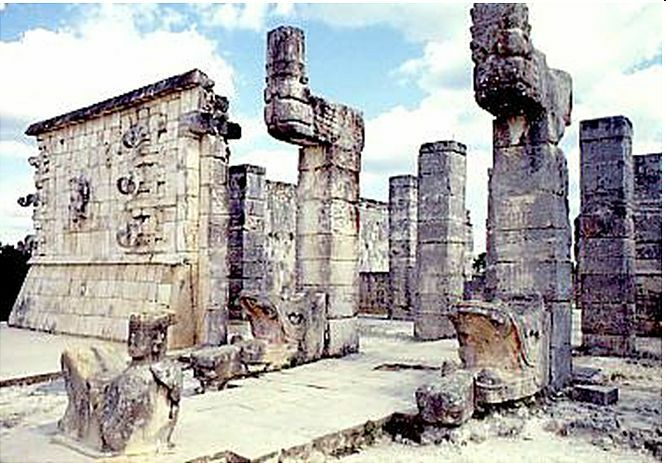 The resurrected humanity on the Highest level is shown by many columns on the top of the Temple placed on the territory of a half-moon. Symbol of half-moon represent the shift of the brain area at the united consciousness formation. Columns on the staircase standing upstairs show the humanity way from the level of Crystal Structure to the Highest level of the material world for the Transition and prolongation of life. 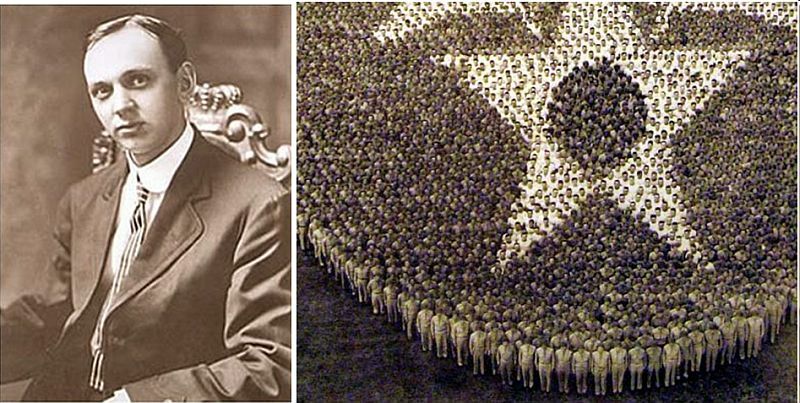 Edgar Cayce the famous American prophet predicted global cataclysms beginning and foretold that hope of humanity will come from Russia. Edgar Cayce predicted that the salvation of mankind from global cataclysms will be based on the principles of association and fraternity. It will be not a communism. But everybody will be responsible for each other. So, it means the unification of humanity consciousness. Just this information ETC transfer in all their messages. 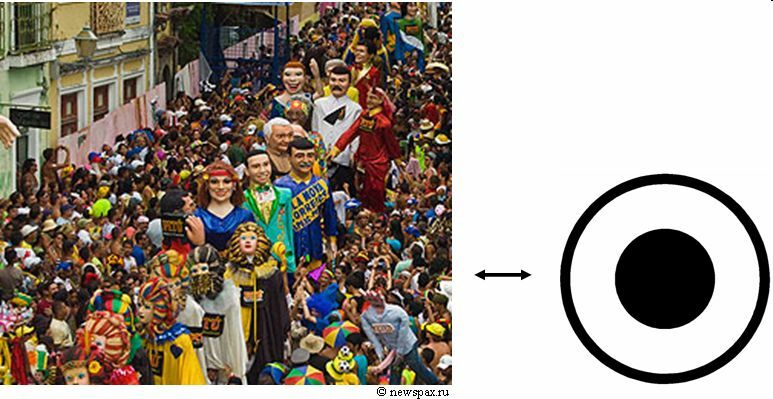 And Russian scientists decoded their pictograms. Conclusion. The pictogram is a warning about the first pre-cataclysm coming soon as an extraordinary event in the physical world which surpasses all natural powers known by humanity. Pictogram gives instruction for change of consciousness mode from individual to the united.